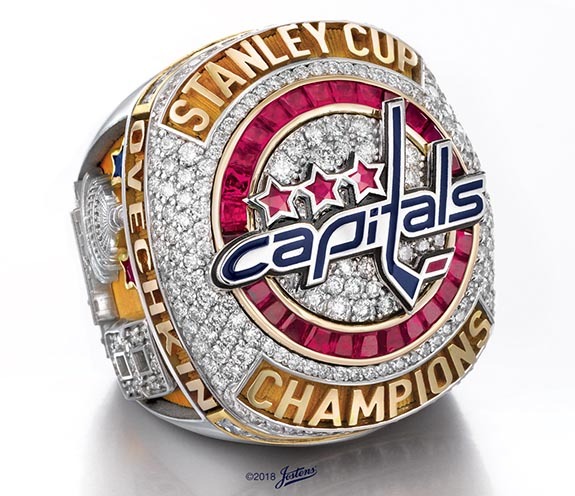 Rubies, diamonds and a sapphire boasting a total weight of 10.2 carats add patriotic pizzazz to the Washington Capitals’ 2018 Stanley Cup rings. The handcrafted, two-tone rings, which commemorate the 44-year-old franchise’s first championship, were unveiled to players, coaches and hockey staff during a private ceremony on Monday night. Overall, the 14-karat yellow and white gold rings are set with 252 diamonds, 35 rubies and one sapphire. 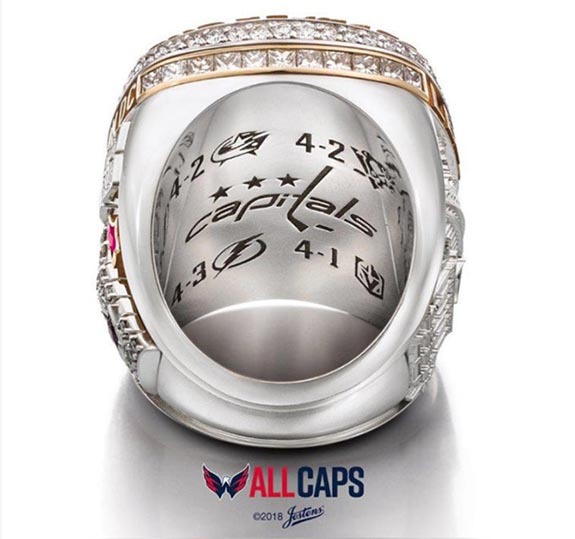 Jostens partnered with the Capitals to craft a ring that pays special tribute to the relationship between the team and the nation’s capital. The logo is rendered in blue and red enamel and lies above a circular ground of 27 pavé-set diamonds. Those white diamonds are framed by 28 custom taper-cut rubies. The words “STANLEY CUP” and “CHAMPIONS” in raised yellow gold lettering wrap around the upper and lower edge of the ring face. Just below the shoulders is a single row of 22 channel-set princess-cut diamonds interrupted by the words “WASHINGTON DC” and the player’s name. These are also rendered in raised yellow-gold lettering. 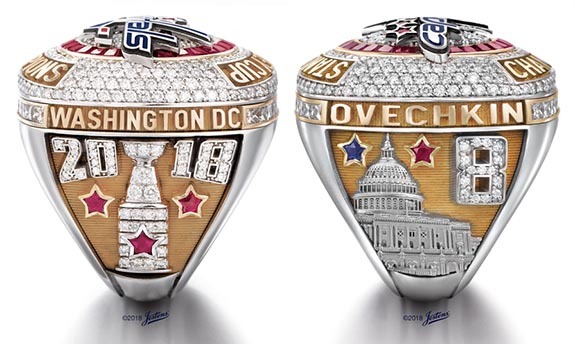 In addition to the player’s name, the left side of the ring features the Capitol building, which is created in stunning detail from 14-karat white gold. A star-shaped ruby and star-shaped sapphire are set on either side of the Capitol dome. The player’s numbers are set with round white diamonds to the right of the Capitol.